Christopher A. Page, an experienced and successful trial lawyer, has been elected by his peers to serve a three year term on the Board of Directors of ALFA International, a premiere global legal network of independent law firms. The board of directors is made up of sixteen committed member-firm attorneys from the United States and around the world who together ensure proper governance of the organization. Chris is Past Chair of ALFA’s Marketing Committee and Chairman Emeritus of the network’s Hospitality and Retail Law Practice Group. He was selected as the ALFA International Attorney of the Year for 2017. Chris is a shareholder at Young Moore where he also leads the firm’s Retail and Hospitality group. He focuses his practice primarily on complex business litigation, employment litigation, and trademark/ trade secret litigation. He also represents clients in non-compete litigation and insurers with the defense of their insureds in tort and commercial litigation, and with insurance coverage analysis and bad faith litigation. Throughout his career, he has served as lead trial counsel in numerous state and federal jury trials. He recently obtained a successful defense result for his client in a false advertising case with a claim in excess of $900 million. Chris is a graduate of Duke University and Yale Law School and is listed in North Carolina Super Lawyers® in the area of business litigation (2018). Young Moore and Henderson, P.A. 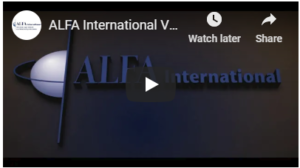 is a member of ALFA International, America’s oldest legal network, consisting of highly vetted firms with full service capabilities who can handle a client’s needs in all 50 states and across the globe. With 150 member firms in the United States, Canada, Mexico, Latin America, Europe, Asia, Australia, New Zealand, and Africa, ALFA International is the premier global network of independent law firms. Young Moore and Henderson, P.A. is a civil law firm in Raleigh, North Carolina representing clients in a variety of litigation and transactional matters. Firm attorneys have extensive experience in the following areas: commercial litigation, insurance, retail & hospitality, trucking & transportation, health care, administrative law, business law & litigation, employment law & litigation, construction, workers’ compensation, real estate, and estate planning.